Some have expressed interest in the r-squared values for common metrics like walk and strikeout rates for starting pitchers. With that in mind I took each of the pitchers with at least 100 innings pitched in 2008-9 and ran their BB% and SO%. This gave us a sample of 92 pitchers and some numbers that are pretty similar all told. Minimal difference. Both are skills, albeit not 100% so. The more interesting aspect from the data set is the biggest droppers and risers for each. Jon Lester saw his strikeout rate rise from 17.4% to 26.7%; Justin Verlander from 18.5% to 27.4%; Joe Blanton from 13% to 19.5%; Matt Garza from 16.6% to 22%; others who jumped at least five percentage points include Adam Wainwright, Clayton Kershaw, and Zack Greinke. The biggest droppers for Ks were Joba Chamberlain (-9.5%), Scott Kazmir (-7.8%), Ervin Santana (-6.4%), Micah Owings (-6.1%), and Bronson Arroyo (-4.9%). Something must be in the Angels water bottles. As for walks. Verlander again excels at something good and saw his walk rate decline 3.5%; Barry Zito and Ubaldo Jimenez saw 2.6% drops; Ted Lilly and Ubaldo Jimenez round out the top five with 2.3% drops and Felix Hernandez experienced the sole other 2% drop. Kyle Davies had his walk rate climb 3.5%, Livan Hernandez and Owings (ouch) 3%, Andy Pettite 2.9%, and finally Santana and Todd Wellemeyer had their walk rates go up 2.5%. For those who love consistency, Jake Peavy, Lester, and Nick Blackburn saw zero movement in their walk rates and Lilly held the same distinction with his strikeout rate. We hoped you liked reading R-Squared Fun with BB% and SO% by R.J. Anderson! First, what season is what axis? I would assume ’08 is the x-axis and ’09 is the y-axis. 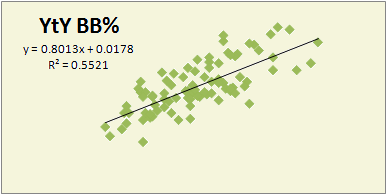 Second, it’s interesting that the slope of both regression lines is well below 1. 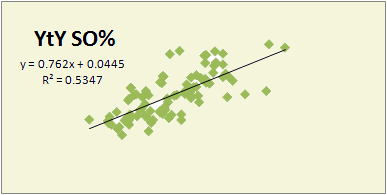 K% went up .5% league-wide, so a .76 slope is very surprising. I know pitchers’ K rates generally drop throughout their career, but not that much in one season. BB rates went up .2% league-wide, so a .8 slope seems a little extreme also. I just figured out that the regression line actually shows regression towards the mean. (who woulda thunk?) I forgot to factor in the intercept in my initial analysis. Unrelated, I wonder if league changes really affected the results that much. Other than Blanton, who already had a third of a season with PHI last year, no other league changing pitchers up there, one way or another.